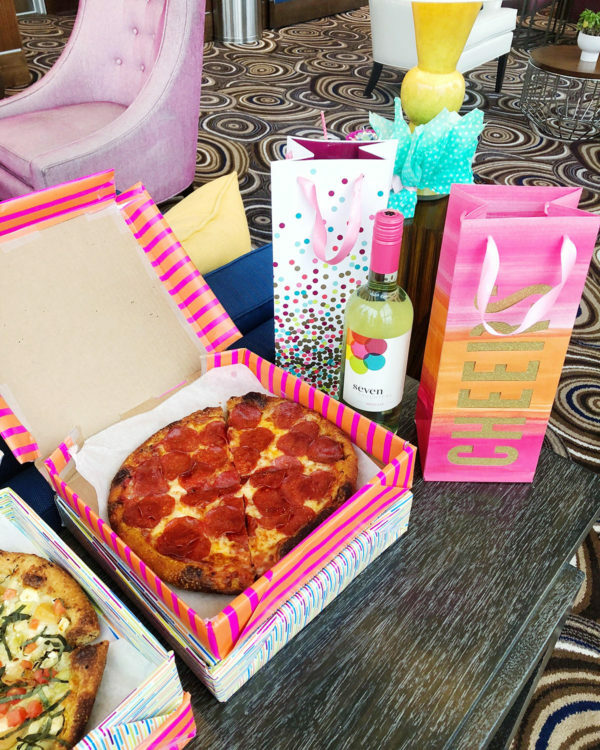 For a fun little pop of color and some added functional decor, I wrapped the pizza boxes (from Happy Camper — my favorite!) in colorful wrapping paper (remember it from under my Christmas tree?!) … I honestly don’t know how the idea came to me (I’ve never seen it before!) but it was such a fun little DIY. A bit of a pain the in you-know-what with how odd pizza boxes are, but pretty simple to do overall. Like I mentioned on Tuesday, I’ve been in a major spring cleaning mood since I got back from Mexico last weekend! I’ve been cleaning out my closet and listing a ton of things on Poshmark and on my second Instagram, so be sure to check out those pages if you’re interested in scooping anything up. I’ll be listing lots more things on Tuesday and Thursday this coming week, too. So stay tuned! Since I’ve been on a cleaning and purging kick, I finally dropped off an old bridesmaid dress and a bunch of jewelry for the Glass Slipper Project! (If you’re not familiar, Glass Slipper Project is a non-profile that collects new and almost-new formal dresses and accessories and provides them, free of charge, to high school juniors and seniors who are unable to purchase their own Prom attire.) I’m bummed I’ll be out of town for the actual shopping dates, but if you’re free in April, you should definitely look into volunteering and helping out. The Best Marriage Advice We’ve Ever Received .. Loved the one simple phrase! The Only Way To “Wake Up” And Become Unstoppable .. So many life-changing tidbits in this one. A must-read! I absolutely need to visit this London cafe! How friggin dreamy is Merritt’s closet?! Oh em gee. Gray’s kitchen is so stunning! My friend Grace just launched a podcast! I found the straw bag mecca on Urban Outfitters this week! 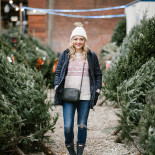 My favorites are this stitched colorblocked bag, this mini bag under $10, this colorful tote, this open-weave bag, this circle bag, this circle wristlet, this round crossbody, this top-handle bucket bag, and this crossbody in both colors. Had to re-order my brow pencil this week… I just got Hallie obsessed with it too when we were in Mexico! And how cute are these green gingham sandals?! I really think I need these $38 pink sunglasses! This straw bag is a great alternative to the Clare V bag, under $100! This wrap skort is SO cute and even more affordable! How fun is this little gingham set?! It’s on super sale, too. So many great finds at White Elephant Designs right now! Aerie has so many cute swimsuits right now! And they’re basically all on sale for $30. While I was placing my swimsuit order (gotta get some new suits before Coachella! ), I fell in love with these knotted slides! In an effort to not place a bank-account-busting order on Revolve for Coachella outfit options, I actually found quite a few fun things on Forever 21! I’ll report back if any of it works out. Lots of very affordable options that were still super cute! Loving these earrings and these earrings! Did you know you can now get Instax Mini polaroid paper in fun colors and patterns?! Couldn’t order this hat fast enough! It’s so cheap (under $30!) and I’ve been looking high and low for a leather-band boater hat. I found my gold statement earrings that I wear constantly on sale for $45! Major shoe lust happening at J.Crew right now… Can you even handle these sneakers?! Also loving these blush pink loafers! How cute is this striped jumpsuit?! It’s on sale for $39! cute idea with the pizza box! i so need those knotted sandals! This marriage advice is so true and I really try to follow it!